Smoked pork belly and Peppadew sosaties are a new take on a South African favourite. 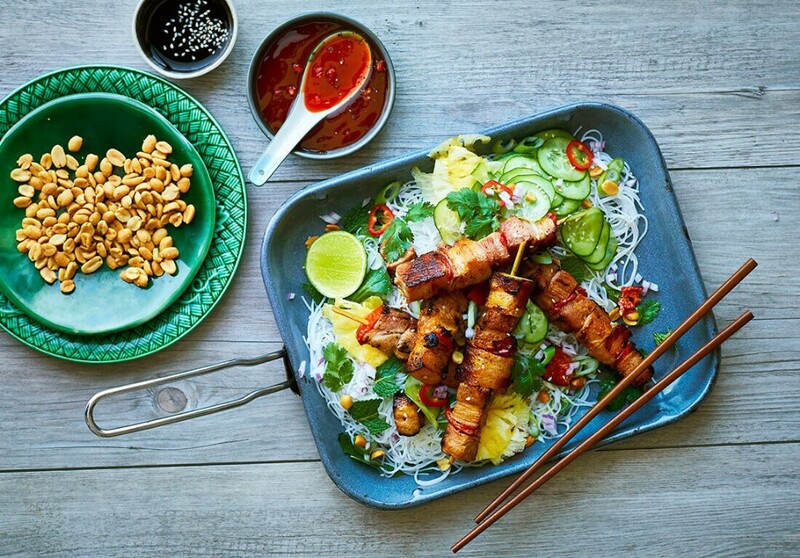 And for that extra zing, a fresh Thai Salad is the perfect accompaniment for these kebabs that will, undoubtedly, be a hit around the braai this summer. Firstly, fry off the Woody’s™ Smoked Pork Belly and Peppadew Sosaties in hot olive oil, till crispy, roughly 10 minutes. Drain on paper towel and cover. To make the salad, soften the vermicelli noodles in a large bowl by covering with cold water and soaking for 3-4 minutes until tender. Rinse under cold water, drain and place in a large salad serving bowl or platter. To the noodles, add the cucumber, spring onions, bean sprouts, herbs, red onion, peanuts and pineapple and gently toss to combine. Squeeze over the lime juice. Using a small bowl and whisk, add together all the ingredients for the dressing and whisk until combined. Pour the dressing over the noodle salad and toss to lightly coat. Serve immediately with the cooked Woody’s Smoked Pork Belly and Peppadew sosaties and extra coriander if required.